Four athletes booked their tickets to the NCAA finals in Eugene, Ore., by the end of the first day of East Preliminary Round competition, while another 17 athletes have advanced to the quarterfinals in their respective events. Cornell’s Rudy Winkler entered the Preliminary competition as the #1 hammer thrower in the country – it’s only fair for him to get the chance to throw for the NCAA title in Eugene. He’s halfway there now as he came out of Jacksonville with the best mark and the only athlete to throw farther than 70 meters in the competition – 70.54m or 231-05. Winkler earned First-Team All-American honors last year with an eighth place finish. Winkler won’t be only Ivy Leaguer in this event in Eugene as Princeton rookie Adam Kelly claimed the final qualification spot with his 214-07 (65.41m) throw. The top 12 in the event made the final cut, and Kelly claimed the 12th spot on his second throw of the competition. Princeton’s Adam Bragg had a little drama in the pole vault qualification as he almost didn’t clear the opening height of 16-10 3/4. Bragg needed all three attempts before he cleared the height. His next height – 17-02 3/4 – was a little easier as he cleared it on his second attempt. It looks like he got his nerves in check or the rust knocked off as he cleared the third height of 17-04 1/2 on his first attempt. That height was good enough to make the top 12 as he had the fourth best showing in Jacksonville. This will be his second trip to the NCAA finals as he finished 12th in 2014 to earn Second-Team honors. 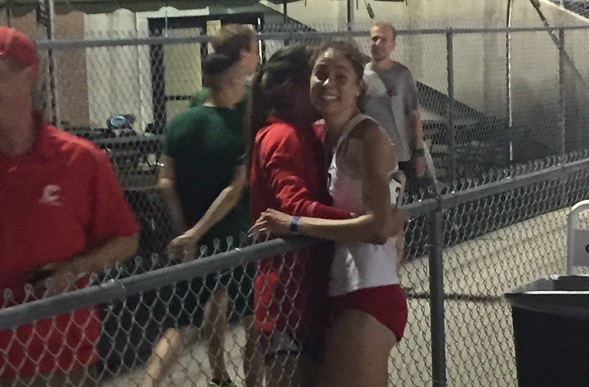 Cornell’s Caroline Kellner was the only runner to advance to Eugene on Day 1. She finished 9th in the 10km in 34:28.93, giving herself a 14 second cushion within the qualification cut. This is Kellner’s first time qualifying for the NCAA Championships in track as she has previously competed at the NCAA Cross Country Championships in 2012 and 2013. Columbia’s Akua Obeng-Afroki advanced to the 400m quarterfinals as the final time qualifier with a new personal best time of 53.14 – the fifth fastest in Ivy history. Dartmouth’s Dana Giordano also ran a new personal best in order to advance in her event. Giordano’s time of 4:18.24 was the third fastest time of all 1,500m qualifiers and is also the 10th fastest in Ivy history. Giordano will have plenty of conference company in the quarterfinals as Yale’s Frances Schmiede (4:19.01) and Columbia’s Olivia Sadler (4:22.72) also finished in the top 24 of the event. HepsNation had 100% of their 400m hurdlers advance as auto qualifiers, as Harvard’s Jade Miller (56.90), Cornell’s Taysia Radoslav (57.78), and Harvard’s Autumne Franklin (58.07) each finished in the top 2 of their respective heats. All three of these women competed in Eugene in this event last year. Six of the seven Ivies who competed in the men’s 1,500m made it to the quarterfinals. Cornell’s James Gowans ran the second fastest time of all of the qualifiers – 3:42.28, a new personal best. Princeton’s Garrett O’Toole (3:45.07), Penn’s Chris Hatler (3:45.08), Yale’s James Randon (3:46.70), and Columbia’s Rob Napolitano (3:46.97) all earned auto qualifiers by finishing in the top 5 of their given heats, while Princeton’s Noah Kauppila (3:45.49) advanced as one of the time qualifiers. Three Ivy women advanced in the 800m, led by Princeton’s Cecilia Barowski in 2:04.85 – the third fastest time among all of the qualifiers. Columbia’s Sarah Hardie was an auto qualifier as she finished third in her heat with a time of 2:07.08. Yale’s Shannon McDonnell was the final time qualifier in the field with her 2:07.01 performance. Columbia rookie Alek Sauer may have edged out a competitor to finish second place in his 800m heat, but he only needed to finish in the top 3 of his heat to advance to the quarterfinals. Sauer ran 1:48.82 in this race, which is a new personal best. The NCAA finalists for the 400m hurdles, 800m, 3,000m steeplechase, discus throw, men’s javelin, women’s pole vault, and women’s high jump will be determined today. Follow the action through the live results once the action starts at noon. This entry was posted on Friday, May 27th, 2016 at 6:44 am. It is filed under Athletes, Spotlight. You can follow any responses to this entry through the RSS 2.0 feed.